We are pleased to announce a new Mobile Menu App that offers an easy way to view menus and nutrient information for products right from your smart phone. This is just one more step we are making in an effort to continually improve the quality of the menus we offer our students and raise the bar on the standards of our school meals. Our focus is on enhancing the diet of students with more nutritious choices here at school and by providing nutrition education that will help students form healthy habits that last a lifetime! Key nutritional improvements that we have made include offering a variety of more fruits, vegetables, whole grains, and fat-free and low-fat fluid milk with our meals. We are also reducing in the levels of sodium, saturated fat and have eliminated added trans fat. We do not supersize our meals, but instead strive to meet the nutrition needs of students within their age specific calorie requirements. 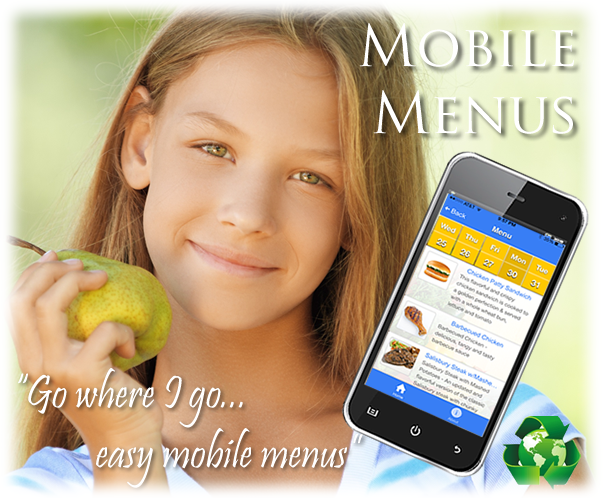 The School Nutrition & Fitness Mobile "Web Menu" App is available in the App Stores!